Hsin-Chu Recorder Orchestra was established in Hsinchu County in 2013 by Chien-Hsien Chen, former speaker of Hsinchu County Council at that time (currently deputy magistrate of Hsinchu County), and Dr. Meng-Heng Chen is the music director and conductor. Since 2015, the ensemble has received the award of Outstanding Performance Troupe in Hsinchu County for five consecutive years. It has been invited to give concerts in Hong Kong, China and Europe for many times. Hsin-Chu Recorder Orchestra aims to become a professional recorder ensemble, so it has been actively looking for opportunities to perform with famous musicians from all over the world. In 2015, the orchestra performed with the eminent The Flanders Recorder Quartet in the 3rd Asian Recorder Festival. In 2017, it performed with the recorder star Maurice Steger in the concert Music from Afar: A Recorder Concert Featuring Maurice Steger in the 5th International Taiwan Hakka Arts and Cultural Festival. In the summer of 2017, it was invited to give the opening concert at Blokfluitdagen in Mechelen, Belgium. 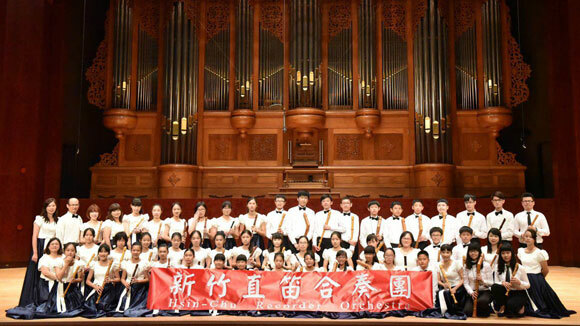 During the Chinese New Year of 2018, it gave a concert named Rhapsody of Recorder Symphony at National Concert Hall. This summer, the ensemble will give a concert named The New World of Recorder Symphony at the concert hall of National Kaohsiung Center for the Arts (Weiwuying). Meng-Heng Chen, faculty of Tsing Hua University, Taiwan. She earned the degree of Doctor of Musical Arts from Boston University in 2010, with a major in Historical Performance and Recorder as her performing instrument, and was awarded the “Student Presentation Honor Award”. Chen is patriotic in terms of promoting Taiwan and the achievements of Taiwanese recorder performance to the rest of the world. She has led ensembles to win gold medals at the “Japan Recorder Competition” in 2005, 2012, 2014, 2015 and 2017. 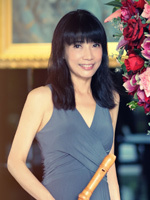 In 2015, she organized the third ARF Asia Recorder Festival in Taiwan, and also performed in the opening concert and conducted the recorder orchestra during the final concert. Chen was often invited to teach and perform in several countries including China, Korea, Japan, Hong Kong, Israel, Holland, Belgium and many others. Since her excellent performance after graduated, she was awarded as a notable alumnus at the Boston University. In 2018, she also earned the award for outstanding teaching from Tsing Hua University.